Coastal Chukchi Sea waters near Kivalina once reliably froze in the early fall but now freeze later in the year. 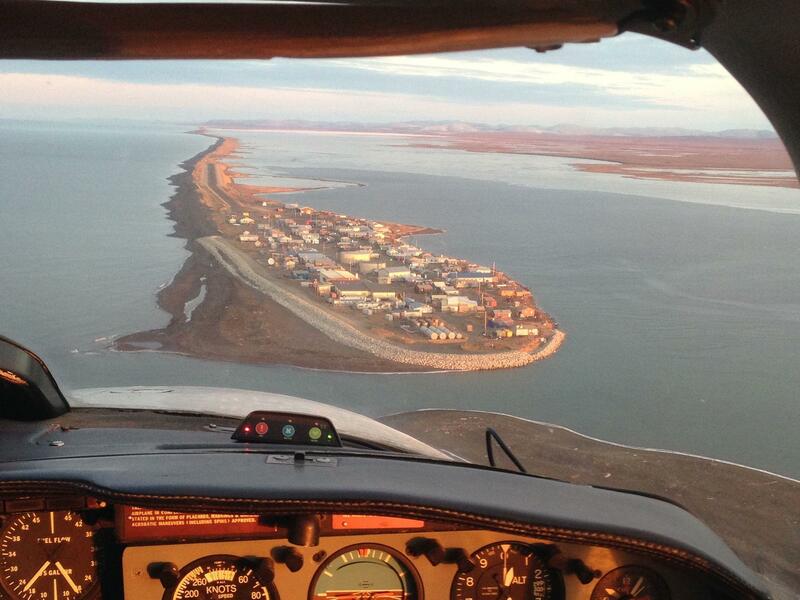 The city’s Relocation Project Coordinator, Colleen Swan, said that leaves Kivalina vulnerable. In recent years, severe storms – some with hurricane force winds -- have caused flooding, erosion, and property damage in Kivalina, leading to several disaster declarations. At risk are fuel tanks, water storage and treatment facilities, tribal and city offices, a health clinic, and homes. Teacher housing had to be moved out of harm’s way. And one year the school was damaged. Standing near the village’s runway, City Administrator Janet Mitchell recently recalled a night in 2005 when waves 10 to 15 feet high threatened to wash out the runway, a vital transportation link. She said everyone who could turned out to try and protect the shore. “One of them was an old, old truck,” continued Mitchell. “They laid it out here. But the surge is so strong, it just got taken out. “I was going to say I don't see anything that looks like a plane or a truck,” Estus commented. In 2007, almost half the village evacuated due to a severe storm. Elders and children left in planes until the weather grounded them. Then they were ferried by skiff across the Kivalina lagoon. Next came a 17-mile ride in a multi-passenger ATV, then 52 miles by bus to the Red Dog Mine. Northwest Arctic Borough Public Safety Director Wendy Schaeffer said the biggest building in Kivalina can serve as a cramped temporary shelter, but a road to the mainland is a top priority. The Army Corps of Engineers bought the village some time by building a rock wall in 2007. But Tribal administrator Millie Hawley said its projected lifespan was only ten or fifteen years. “It's something that we need to take action on today. It's not something that we could wait for another 15 years.” said Hawley. Kivalina voted in the 1990s to relocate and has been working ever since to find the $100 million or needed to do that. In a 2009 erosion assessment report, the U.S. Army Corps of Engineers identified 26 Alaskan communities whose viability is threatened by storm surge, flooding, and erosion.